This week’s spotlight is on Professor Fei Miao, who is an assistant professor in the department of Computer Science and Engineering. Fei received a Bachelors of Science in Automation with a minor in finance from Shanghai Jiao Tong University. She then went on to receive a Ph.D. degree, a dual-Masters degree in Statistics, as well as the “Charles Hallac and Sarah Keil Wolf Award for Best Doctoral Dissertation” in Electrical and Systems Engineering from the University of Pennsylvania. Before joining UConn in 2017, she was a postdoc researcher at the GRASP lab and the PRECISE lab at the University of Pennsylvania. Some of her current key active research projects focus on (1) data-driven optimization and control and their application to transportation resource allocation, (2) cyber-physical systems security, (3) safety of autonomous transportation systems, and (4) coordination of autonomous vehicles. In terms of future directions for her research, she hopes to work on (1) the planning, reasoning and learning of autonomous systems, (2) safety assurance of autonomous vehicles, (3) resilient and secure autonomous systems, and (4) heterogenous transportation networks. The broad agenda of her work is to develop the foundations for the science of data-driven cyber physical systems and autonomous transportation systems. More specifically, she focuses on the safety, efficiency, and security of these systems. Her background spans several technical fields that are all relevant to cyber-physical systems and autonomous transportation systems. This includes optimization, control theory, machine learning, game theory, and formal methods. Thus far, her research has focused on data-driven dynamic robust resource allocation for system-level efficiency with learning, control, and optimization approaches. She has also worked on the optimal control and attack detection approaches for cyber-physical systems. In addition to system modeling, theoretical analysis, and algorithmic design, her work has also involved experimental validation in urban transportation data, simulators and small scale autonomous vehicles. She recently finished two publications, new in 2018. The first is titled “A hybrid stochastic game for secure control of cyber-physical systems”, which was published in the journal Automatica. This paper establishes a zero-sum, hybrid state stochastic game model, which can be used to design defense policies for cyber-physical systems against different types of attacks. This model that was proposed in this paper consists of (1) physical states that are described by a set of system dynamics, and (2) a cyber state that represents the detection mode of the entire system, which is composed of a set of subsystems. Finally, the team applies a moving-horizon approach which provides scalable and real-time computations of switching strategies. Her second publication is titled “Data-Driven Robust Taxi Dispatch Under Demand Uncertainties”, which was published in IEEE Transactions on Control Systems Technology. The paper sets out to address the problem on how to deal with uncertainties in terms of predicted customer demand, while also simultaneously fulfilling the system’s performance requirements. The solution was a data-driven robust taxi dispatch system that takes into account the spatial-temporally correlated demand uncertainties. Dr. Miao is also current a Co-PI for two different projects. The first is titled “Modeling, Analysis, and Anomaly Detection for Cyber Secure Power Distribution Networks”, which is funded by Eversource Energy. The second is titled “Energy Management Systems for Subtractive and Additive Precision Manufacturing”, funded by CESMII. 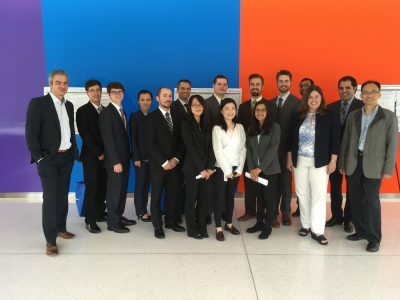 UTC-IASE held its first ever Summer Career Fair at the new Innovation Partnership Building at the Storrs Campus of the University of Connecticut on June 6th. The event was well attended by UTC-IASE graduate fellows, UCONN faculty, and representatives from UTC business units including UTC Aerospace Systems, United Technologies Research Center (UTRC), United Technologies Climate Controls & Security, Otis, and Pratt and Whitney. United Technologies Human Resources representatives were also in attendance to answer questions from job-seeking students. The format of the event was a non-traditional career fair in which students were given the opportunity to prepare individual poster presentations showcasing their research and work experience. This format encouraged one-on-one interaction and in-depth conversations about the unique experiences and competencies of the presenting students. UTC-IASE Graduate Fellow William Hale said that “taking part in this career fair was a highly rewarding experience. Not only was I able to showcase the hard work I have put into my Ph.D. research, I was also able to have one-on-one conversations with UTC employees outside of the business unit I collaborate with. This provided me with greater insight into the broad applicability of my research, which will prove to be invaluable as I enter the final years of my Ph.D.” This first career fair event by UTC-IASE was well-received and successful in its goal of forging connections between graduating students and hiring managers at UTC business units. UTC-IASE hopes to follow this success with more career fairs and other events in the future. Presenting fellows included Brian Baillie, Chen Chen, William Hale, Kyle Palmer, and Evangelos Stefanidis from the Department of Chemical and Biomolecular Engineering; Manish Goyal from the Department of Computer Science and Engineering; and Yan Li, Khushboo Mittal, Donald McMenemy, Iman Salehi, James Wilson, and Danxu Zhang from the Department of Electrical and Computer Engineering. This week’s spotlight is on Dr. Abhishek Dutta, who is an assistant professor of Electrical and Computer Engineering. He is affiliated with the UTC Institute for Advanced Systems Engineering and the Connecticut Institute for the Brain and Cognitive Sciences, here at the University of Connecticut. He conducted his postdoctoral research in aerospace engineering in the Coordinated Science Lab at the University of Illinois at Urbana-Champaign, with Cedric Langbort. He received a PhD in Electromechanical Engineering from Ghent University under the supervision of Robin De Keyser and the advice of Jan Maciejowski, as a junior member of Wolfson College Cambridge. He also received an MSc with distinction from the University of Edinburgh, including an informatics prize for his outstanding thesis. In the upcoming months, Dr. Dutta will be giving a presentation titled “Microcircuit Design for Real-Time Data Acquisition and Neuromuscular Control of Insect Motion” at the Cognitive Computational Neuroscience Conference in September of 2018, in Philadelphia, Pennsylvania. This presentation discusses a framework for an accessible device that would enable the control of advanced cyborg insects that would overcome current technological limitations that plague today’s micro-robots. This work has received attention from Governor Malloy and President Herbst. Dr. Dutta has also recently submitted a paper titled “Robust Design of a Multirotor Aerial Vehicle” to the journal IEEE Transactions on Cybernetics. This paper introduces the methodology of systematic robust design of multi-rotor vehicles. Robustness in aerial vehicles is highly desirable as it guarantees a desired level of performance, even when there are environmental uncertainties present. Thus far, robustness has been considered in terms of active control in the space of multi-rotor vehicles, without exploring the design space itself. In this work, a conceptual design followed by a robust design is performed to come up with the specifications that lead to least uncertain performance of the multi-rotor vehicle, with respect to stochastic wind disturbances. Evan Faulkner, a Junior undergraduate student majoring in Electrical Engineering is working on a project titled “Micro-circuit design for modeling and control of insects” under Dr. Dutta. He will also advise two other students working on projects this summer: Nicholas Gorbenko, a Senior undergraduate student majoring in Electrical Engineering, who is working on a project titled “Cultured Neural Networks for Robot Control”, and Hossein Hamidi, a PhD student in Electrical Engineering, who is working on “Modeling and control of neuromuscular dynamics”. This summer, Dr. Dutta plans to work on two individual research projects. The first is titled “Design and Control of Cyborgs and Neural Cultures”. A state of the art lab has been set up for the design of biological circuits, which will help to enable the modeling and control of insects and also study neuronal cultures. This knowledge will then be leveraged to treat neurological disorders. The second project is titled “Design and Control for Biomedical Applications”. This project is a collaboration with the University of Cambridge and Ghent University amongst other European partners. Dr. Dutta also expects to receive a $225K grant from the Defense Advanced Research Projects Agency (DARPA), Strategic Technology Office (STO). The grant is titled “Collection and Monitoring via Planning for Active Situation Scenarios (COMPASS)”. Partnering with UTRC and SRI, the COMPASS team will work towards enhancing gray zone operation by helping Joint Task Force Commanders understand the intent and tactics of adversaries as they engage in deceptive covert gray zone activities. Instead of relying on passive collection of sensory data, COMPASS will employ probing strategies that stimulate the environment with controlled actions to generate desirable intelligence. This week’s faculty spotlight is on Dr. Matthew Stuber, an assistant professor in the department of Chemical and Biomolecular Engineering. Dr. Stuber received his Bachelors of Science in Chemical Engineering from the University of Minnesota- Twin Cities, and his PhD from the Massachusetts Institute of Technology. His current research focuses on Process Systems Engineering topics of (1) Global Optimization, (2) Process Improvement and Intensification, (3) Renewable Energy and Process Integration, (4) Model Validation, and (5) formal Robust Design Under Uncertainty. Over the course of the summer, Dr. Stuber, and his students will be participating in a variety of conferences, presentations, and research projects across the country and internationally. One of Dr. Stuber’s co-advised students, William Hale, will be presenting at the American Controls Conference in Milwaukee, Wisconsin on June 27th-29th. The presentation is titled “Design of Built-In Tests for Robust Active Fault Detection and Isolation of Discrete Faults in Uncertain Systems”. Dr. Stuber will also be chairing the session titled “Fault Detection 1”, Friday June 29th. Another one of Dr. Stuber’s students, Matthew Wilhelm, will be presenting at the second annual JuMP-dev Workshop on June 27th-29th, at the Institut de Mathematiques de Bordeaux, Universite de Bordeaux, in France. The talk is titled “EAGO: A Deterministic Nonconvex Optimization Package for Julia”. In addition, Dr. Stuber’s lab is hosting a student this summer as part of the UConn eREU program. UConn’s Entrepreneurial Research Experience for Undergraduates program (eREU) aims to immerse students in an integrated program containing entrepreneurship training and fundamental engineering research experience. This student will help to develop a new software and controls technology for significant energy-savings in municipal wastewater treatment and help develop a business and commercialization model around the technology. Dr. Stuber and his students are also involved in conducting cancer research, using a new mathematical and numerical analysis approach. They will apply first-principles spatiotemporal conservation and transport equations to model solid tumors, an example being malignant breast tumors. With data that is supplied by the lab’s experimental and clinical collaborators at the University of Cyprus and the University of Tokyo, they will apply novel methods in global optimization to validate the models, and then use these models to understand the phenomena and limitations behind drug and nutrient transport in tumors. They will also use these models to understand the effects of certain drug therapies. More specifically, they are using the validated models to better understand how using certain drug therapies to modify the tumor microenvironment can enhance patient outcomes. They are hoping to publish this work and its findings in about a month. Dr. Stuber is currently in the process of judging the Water Abundance XPrize. This is a $1.75 million dollar competition for innovators and start-up companies to prove significant cost savings and efficiency improvements in atmospheric water generation to solve the ultimate challenge of broad water security. In terms of upcoming publications and research, he has recently submitted a paper for the upcoming special issue of “Modeling and Simulation of Energy Systems” for the journal Processes. This paper discusses the development of a new dynamic model of concentrated solar thermal energy systems for hybridizing industrial process heat application. This is a first-of-its-kind model, constructed for optimizing the design of the hybrid solar industrial process heat system from a new-technology investment perspective. Finally, the lab’s advanced deterministic global optimization software, written in the Julia programming language is up and published (https://github.com/MatthewStuber/EAGO.jl). The objective of this project is to provide users with advanced methods and algorithms for deterministic global optimization in an easy-to-use language (which is very similar to MATLAB or Python), but that also has the computing power of C and FORTRAN. New features are continuously being added to and developed for the new program. Dr. Stuber was recently named the recipient of the American Institute of Chemical Engineers Computing and Systems Technology Division “W. David Smith, Jr. Graduate Publication Award”. He was nominated for this award based on his paper “Convex and Concave Relaxations of Implicit Functions” published in 2015 in the journal Optimization Methods and Software.